When I first made the decision to actively try to collect everything under the Shogun umbrella, I chose to focus initially on the ephemera, but I knew it was only a matter of time before I was forced to get some of the diecast toys. I did not (and still do not) have a plan of action or order in which I wanted to get them. I would just buy whatever was the best value and fill in the gaps later. 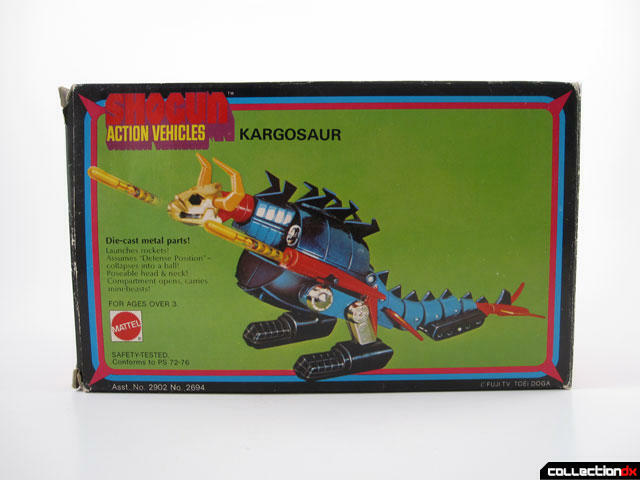 But one of the ones I figured I would want pretty early on was the Shogun Action Vehicles Kargosaur. 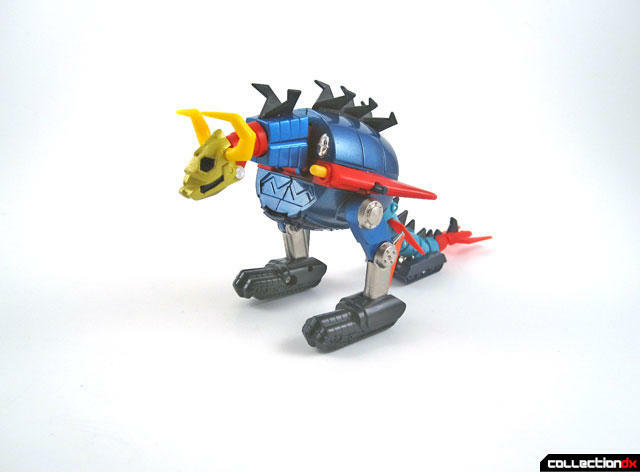 The Kargosaur was Mattel's re-branding of Popy's GA-52 Daiku Maryu (or "Great Space Dragon", as we knew it from Force Five here in the US) and is still labeled as such on the underside of the toy. Although I never owned one as a child, I vividly remembered lusting after it whenever the commercial for Mr. Big Toyland would come on TV. 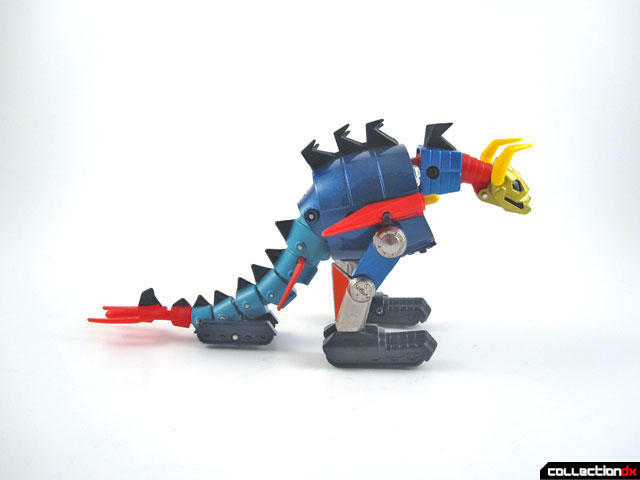 The Kargosaur is about 7" long and has a diecast body and legs. The rest of the toy is high quality plastic. The box measures roughly 7.75" x 5" x 3.75" and the toy rests in a styrofoam tray inside. 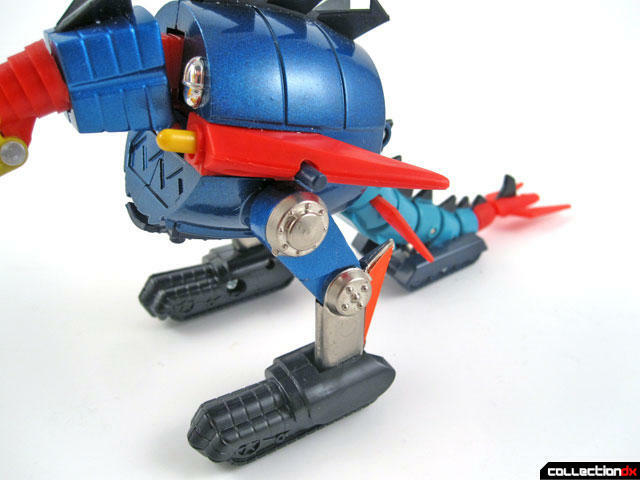 Several play features are incorporated into the toy. First and foremost, firing missiles! Yellow missiles can be launched from the shoulder area by pressing a small black button on the side of the toy. Be aware of this button when you hold it because it's located right about where you are likely to put your fingers when picking the toy up. I inadvertently fired one by accident when I first got it and was lucky not to lose the missile. 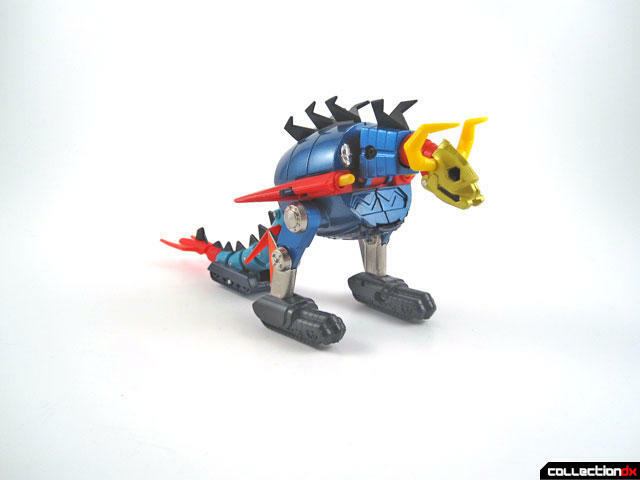 The second feature of note is that the toy can "roll up like a ball". OK, so that's a pretty terrible description of that action. When under heavy attack, the ship could curl up into itself and use it's heavily fortified body to withstand the assault. 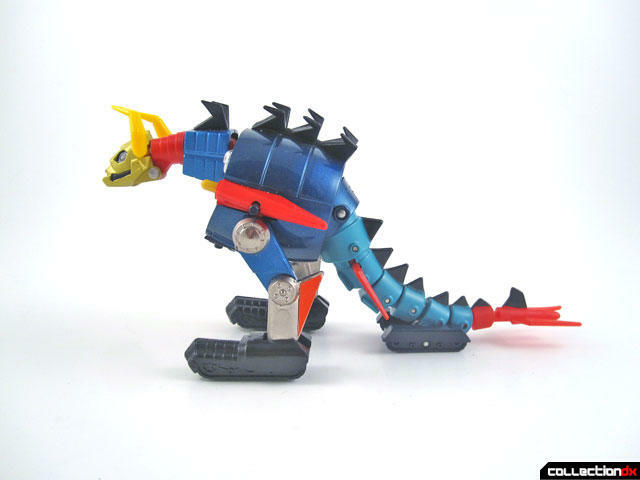 In vintage toy style, the transformation here isn't just like in the show, but it was close enough for kids of the day to finish the job with their imaginations. The final feature concerns the three supplemental vehicles ("mini-beasts"!) that are housed in the Daiku Maryu; here called Nessar, Skyler and Bazoler. The tiny plastic vehicles are a bit more than 1/2" long and resemble something you might see as pieces of a board game. 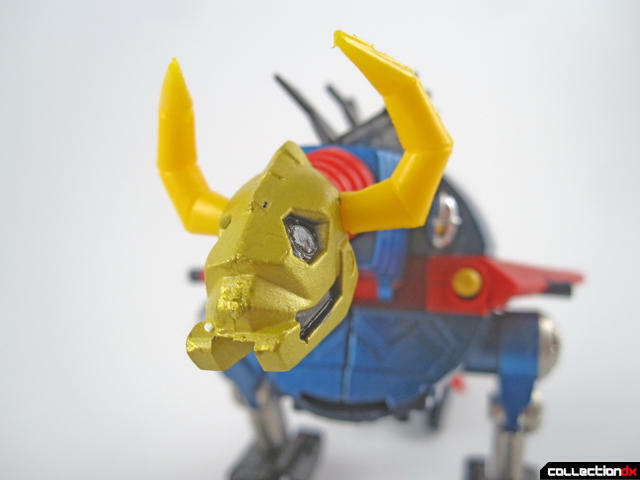 The come molded in red, blue and yellow and which character gets which color varies. 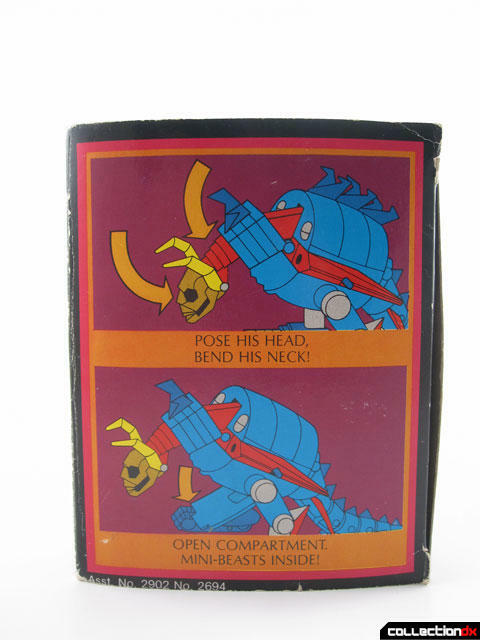 When not in use, they can be stored in a compartment in the chest of the toy. As you may know, I'm not a big fan of diecast toys so a large part of the reason I wanted these toys was just for the boxes that bore the Shogun brand. 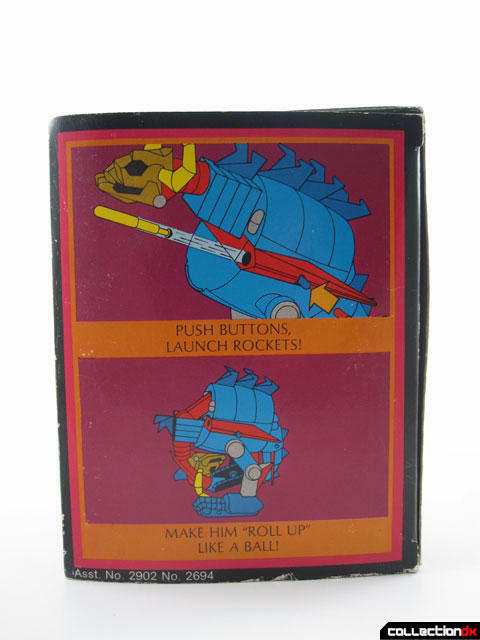 The sides of the box advertise the various play features while the back shows off many of the other toys in the line. I find it somewhat amusing that the box mentions "17 in all! ", but only shows 16. This is even funnier if you consider that there are actually 18 vehicles in the line (the Daimos Truck and Liabe are missing from this image) and 19 if you count the European-only release DX Grandizer Saucer.